4 Bedrooms, 3 full bathrooms. Private 3 acres with swimming beach and dock. 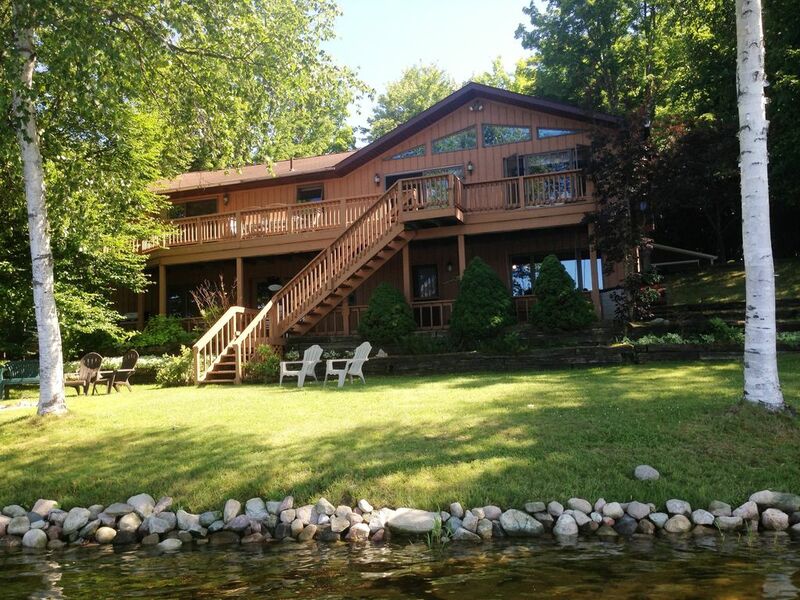 Huge family vacation home with picture-perfect setting overlooking beautiful Sunrise Lake, an 80-acre all-sports spring-fed lake located 4 miles East of LeRoy, MI. Paved drive leads to house nestled on private 3 acres with 200 ft. of lake frontage, with your own private sandy beach and swimming raft. Bring your boat to tie up to the 30ft dock. Kayaks (3) provided, plus paddle boat for cruising the lake. Light and airy, with vaulted beamed ceiling and panoramic views of the lake. Relax on the huge upper deck, accessible from the family room or master bedroom. Head down the stairs to the covered patio below - or across the lush lawn to the gazebo or swimming beach. You can also access the covered patio from the downstairs game room, located in the full walk-out lower level. At night, gather around the fire pit to roast marshmallows. Amazing views of the stars! Satellite TV with flat screen TVs in living room, family room, and MBR. *Panoramic lake views from great room, kitchen, master bedroom. *Expansive deck with stairs to lower level. Latching safety gate. *Great room with new full-size sofas (2) and flat screen satellite TV. *Master bedroom: Huge suite with deck access, private bath, queen bed, double walk-in closet. Separate sitting area with queen sleeper sofa. *BR #2 - Queen-sized bed. Lake view. *BR #3 - Queen-sized bed. Lake view. *Laundry room with washer & dryer. * Walk-out to covered patio. * Family room with Foosball, Air Hockey, satellite TV. * Queen sleeper sofa in family room. * BR#4 - bunk (twin top, full-size bed below). Linens:(OPTIONAL) Linen package which includes sheet sets, pillows, comforters, blankets plus bath towels & washcloths, kitchen towels. I used to live here year-round with my boys before moving south to NC. It's a great place to raise kids. This has a beautiful setting -- on our own point overlooking the lake. It's so peaceful. There's always a breeze. You won't believe the incredible view of the stars. Sunrise Lake is quiet - it's an all-sports lake but there are very few boats. The lake is spring-fed. It's really clean with a hard sandy bottom. In the morning, the water is like glass. You can even see deer playing along with water's edge. toilet, combination tub/shower, Downstairs for BR #4. 30 ft dock. Swimming, fishing. 200 ft of frontage on Sunrise Lake. Spring-fed lake with hard sandy bottom. Great for swimming. Dock, raft, kayaks, paddleboat. Lakefront with swimming beach and boat dock. Panoramic views of lake. 2 Full size refrigerators: upstairs and downstairs. Fully stocked kitchen with plenty of serving dishes, pots and pans, utensils, dishes for 16, wine glasses. Small appliances: coffee maker, blender, crockpot, electric griddle, mixer, toaster. Table with 6 chairs, 3 counter stools, outdoor table with 6 chairs. Flat screen TVs in great room, MBR, downstairs family room. Foos ball table, air hockey. DVDs and player upstairs. Tons of kid's movies plus VCR downstairs. Rowboat for fishing plus paddleboat. Upstairs deck running full length of the house. Downstairs patio. My family (2 parents, 2 kids and 1 dog) were joined by both sets of grandparents at this wonderful cottage. It had more than enough room for us. Some of the best parts were the large deck overlooking the lake, the kayaks, paddleboat and row boat, along with a swim raft. There was even some fishing done. The place is close to some Amish farms where you can get some great fresh produce for meals. A large grill made it easy to prepare meals for everyone. The large fire pit near the water was a nice way to end some fun summer days. It was a great place to enjoy some quality family time. House is kept up very well and lake is super clean. Just overall a great place to relax. Well-equipped home with plenty of room to spread out. Beautiful lake views. The water was great for swimming and the new swim platform was nice! My family of 10 had a wonderful, relaxing vacation. Wanted to share with anyone who might be looking for the perfect family getaway location. Sunrise Lake is a beautiful quiet little lake that has everything a family with kids could ask for. We never felt like we needed to leave for other entertainment. Everything was right there for us, boating, fishing, kayak and paddle boat as well. The lake was very clean being spring fed and my Grankids enjoyed turtle hunting everyday. Fishing was good as well. The house was perfect for our family with all kinds of room, especially enjoyed the extra kitchen downstairs too. Thanks Todd, much appreciated ! Looking for the perfect vacation spot? This is it! This home is a wonderful place for a family gathering! We had our family of three couples and one teenager, and dog, for a week in early June, and couldn't have been happier! We had one day of rain, which kept us happily inside with air hockey and other games for a friendly competition. The other days had us out on the lake with the three kayaks, row boat, and paddle boat, as well as the multitude of blow up beach toys and the swim platform. The fishing was great and the lake quiet (we were the only ones on it, I swear!) The well-stocked kitchen allowed us to prepare every meal for the week! There was nothing missing! Wood was provided for our end-of-stay bonfire, and the stars treated us to quite a display........there were BILLIONS of them! We had wild-life sightings as well! We hope to return in the future! Thanks to Todd and family for a wonderful vacation! Family vacation home on Sunrise Lake -- a tranquil 80-acre spring fed lake that is ideal for swimming, fishing, boating. Private 3 acre setting with 200 ft of lake frontage, your own private sandy beach and 30-ft. dock. Located 4 miles east of LeRoy, Michigan. Within 1/2 mile of State Land, for mountain biking and hiking. Security deposit required with reservation contract. Weekly rentals only . Sat - Sat Cleaning Fee $150 Linen Fee $150 - Optional Pets upon approval; additional fee.